If the title of this post suggests that I might have some special wisdom to share on the topic of Chinese rice porridge, or "congee" (we also call it "jook" in Cantonese), I apologize because that's actually very far from the truth. Unfortunately, I am not a knowledgable Chinese cook (I'd give that crown to my mother). My Chinese cooking is relegated to basic stir-fries and recipe-following with tips I picked up growing up. I get by and it suits me for now. With Chinese New Year a few days away, I wanted to post a Chinese recipe and this is one I wanted to write down and "save" on this blog (I have these daydreams where my son, grown up, looks up some of his favorite childhood recipes from this blog to cook for himself). So this is Chinese rice porridge, my way. And "my way" is essentially a thick rice porridge. Maybe it's my general preference for hearty, filling foods but I like my rice porridge to be substantial - thick and full of flavorful meats and other ingredients. My family is on the same page. Growing up, I remember seeing my grandfather have plain congee (made with just rice and water, maybe a pinch of salt) for breakfast and it was so thin, I thought of it as more like boiled water with some rice floating in it. He'd open up a jar of some kind of black fermented beans to have with it and that made breakfast. My mother makes a mean congee, too. Her's is on the thinner side (maybe I should just say it's more on the "normal" side) but she'll thicken it up if she knows I'm coming. But there's really no right or wrong way to do it. It's all a matter of preference and adjusting the water to rice ratio accordingly. So congee is something of a staple and a comfort food for us, often eaten for breakfast. You can usually find it when you go for dim sum at Chinese restaurants. I started making congee at home some time after I got married. For the longest time, I'd just "eyeball" things in a pot and I never measured the ingredients. I just had to make sure I used the same pot each time! So a while ago, I finally did a little measuring (so I could start using different pots and write things down here) and realized that I make my congee in a ratio of about 1:7. That would be 1 cup of rice to 7 cups of water. Typically, the ratio is more in the 1:10 range for medium thick porridge, and for a very thin consistency, as much as 13 cups of water could be used for one cup of rice! There are so many kinds of congee. It can be flavored with beef, pork, chicken, fish and other seafood. I really like beef with dried scallops (it adds a great saltiness) while my husband's favorite is pork with preserved eggs (also called "thousand-year eggs"). These eggs (usually duck eggs), with their oddly dark appearance and gray yolks, might not look very attractive but we love the creaminess and deep flavor of the yolks. Taking a cue from my mother in law, who makes her delectable pork and preserved egg congee with dried oysters, I often make the same. That congee, with a side of noodles, is probably my husband's favorite Chinese-style breakfast. I like to buy dried "shrimp-flavored" noodles at the Chinese market. It takes a few minutes to boil and while that's happening, I gently heat up some oil with a few cloves of crushed garlic. After the noodles are drained, I toss them with the hot garlic oil along with some soy sauce, oyster sauce, and a touch of sesame oil. We might have congee for lunch or dinner but it's a fun change for breakfast. We get to break out our chopsticks and shake things up from our usual pancakes and eggs! As I was writing this post, I realized I have so many memories wrapped around this dish. For instance, I'm reminded of how much I liked my sister's congee growing up. I don't think she made it for me more than a couple of times but it stuck with me. She made a meat version (I think it was beef) but she somehow turned them into meatball-like bits in the porridge. The little meatballs were so juicy and full of flavor from her marinade. I remember biting into it the first time and how they practically burst with flavor in my mouth. It's funny because my sister didn't cook for me that much growing up but the few times she did left an impression. Being 7 years older than me, she was (unfortunately, for her) responsible for me through a good chunk of my childhood. I wanted to tag along with her during much of my pre-teen and her teenage years. As you can imagine, that must have been awkward (not to mention, annoying) for her! So here's the funny thing: sometimes she would leave me home (those were the days when we stayed home on our own a lot younger than we'd let our kids do now) and to make me feel better, she'd cook congee for me or buy me some donuts from our local donut shop! Clearly, she knew that food was the way to my heart and good disposition! I always chuckle when I think about that now. Recipe notes: I'm keeping things simple and leaving my loose recipe for beef congee below. As with most savory cooking, you have a lot of discretion as for how you can adjust it. You can use more or less meat, or substitute the beef for chicken or pork. I like my porridge thick but if you prefer a thinner consistency, add more water to yours at the start (10 cups of water to 1 cup of rice seems to be good medium ground). My congee cooks up rather quickly but if you're using more water, you can give it a chance to simmer longer. Congee thickens as it sits. It's best eaten fresh; after it's cooked, let it sit for 10-15 minutes, then serve. Should you need to reheat it, add some warm water to it as you heat it up on the stove, stirring occasionally and not too vigorously. I find it tends to separate and break down too much if you stir it too hard and often. This recipe makes a thick porridge. If you prefer a thinner consistency, use more water (about 10 cups water to 1 cup rice for medium-thick). Cook until rice blooms and you have a creamy texture. Marinade beef by tossing it with the soy sauce and sesame oil. Let sit for half an hour, or overnight. In the meantime, place rice in a medium size pot (I like to use a Dutch oven/enamel cast iron pot). Rinse the rice 2-3 times under cold water. Then add 7 cups of cold water and let sit for 15-20 minutes. Over high heat, bring rice and water to a boil. Lower heat to medium-low and give it a light stir. Let cook with the lid on but slightly ajar, checking on it and stirring occasionally. Once rice begins to bloom, in about 10-15 minutes, add beef. Turn heat down to low and continue to cook until rice is fully bloomed and the porridge has a creamy consistency, about another 15 minutes or so. During this time, stir the mixture occasionally to make sure it isn't settling/sticking at the bottom of the pan. Taste, and adjust with salt and season with some white pepper. I like to stir in a small splash of sesame oil as well. Turn the flame off, cover, and let porridge sit for about 15 minutes (it will continue to thicken slightly during this time) and serve. The rice porridge is best eaten fresh. If you need to reheat it, place porridge in a pot with a few splashes of water (depending on how thick it is), and warm over medium to medium-low heat, stirring occasionally. I love the idea of saving recipes on my blog, too, Monica. I don't know how permanent it will be, but there's something special about preserving them online. Happy Chinese new year! I love hearing how your family enjoys congee. It's the ultimate comfort dish for us. I enjoy it any away it's prepared but my husband loves it on the thicker side too. I loved that you used to follow your sister around and hearing about her congee she made for you. I used to drive my brothers insane by following them around too :) Your congee looks perfect and so comforting! Hope you and your family have an amazing CNY! Ahhh...Kelly, I am sure you are a far greater expert on this topic! We're definitely in the minority with the thicker porridge, I think. : ) So many memories are always wrapped around food, isn't it. As for CNY, I've already had one early meal and headed for another tonight...lots of eating...and enjoying the cooking of family "professionals". You have a great one, too! Thanks, Christin! Thanks for reading. This is such a lovely post! I love the memories food brings and I'm with you on saving recipes for our children. Mine are both married with homes of their own so I'm not sure how many recipes they actually try! I think the holiday recipes will be the ones they use the most. I've been thinking more and more about eating dinner for breakfast - because don't we often eat breakfast for dinner? Eating hearty early in the day may prevent the extra eating at the end of the day for me. Will you celebrate Chinese New Year? I used to work for a company and we had factories in China so we always had to shut down production during those few weeks when everybody went home to the country to celebrate with family. Anyway - this recipe looks so satisfying and warming - delicious! I am so sure your children will find your blog invaluable if they don't already! Once they have more time to cook, they know just where to look (and who to call)! : ) We do celebrate CNY. It's fairly low-key these days but there are a few family meals and I get to enjoy all the delicious traditional New Year foods thanks to our moms. And I do think it's fun to shake up what we eat at various meals. For me, having a heartier breakfast does really set me up to feel more satisfied during the day. If I skimp on breakfast, I just find myself making up for it later and ravenous by evening! Monica, I loved reading about your story with your sister. Those are the best memories, family and food ones! I have an older sister too, about 9 years older but she lived in a difftent country wth her husband so wasn't around for much of my teen years. In fact, I'm about 7 years older than my baby brother so maybe he'll have food stories to tell of our time together! Maybe I'll make this tonight, I was looking for inspiration, what I love about this dish is that my eldest is a vegetarian. This can serve everyone, with different toppings. Thanks for the inspiration, it's breakfast for dinner tonight. Oh, and I found it funny about you not knowing Chinese food. I'm the same way with Indian food, that's my weakest cuisine! What sweet food memory! I miss congee with century eggs and fried dough stick! Monica, I thoroughly enjoyed reading about your memories, it's so special. That's what it is about food and the memories that go with it. Your sister seems like a very sweet one, your family sure have lovely people in it. This dish Conjee, is so similar to something my grandma used to eat too, we called it Kanji. Can your believe it, the similarities in the names too..?..Wow. Just like your grandfather, she ate it plain but with some pickle. Simple and healthy food made them strong. I'm quite intrigued by all the way you can enjoy this. Very interesting. I will have to give this a try. Keep writing more about your childhood memories, loved reading it. Oh my goodness, Asha! I found your comment so so interesting. 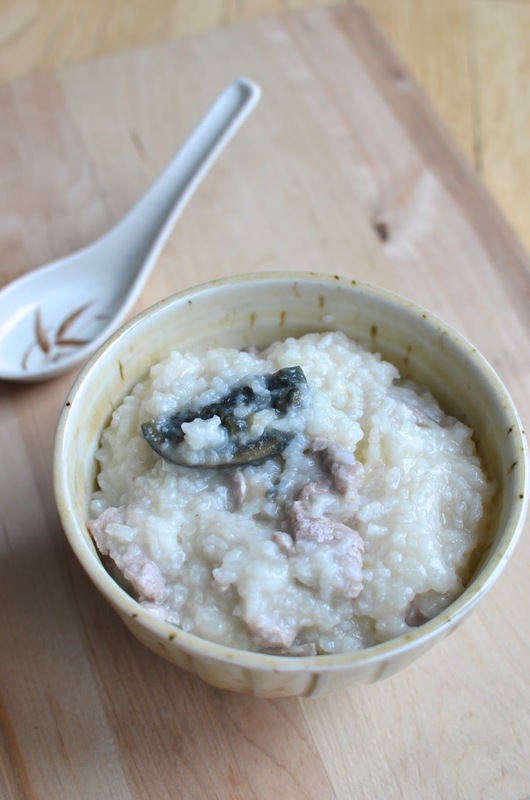 The similarity of the congee and kanji is so interesting...as well as how your grandma had it plain!! Love finding that out and learning about that so thank you so much! You have a great week! PS - I love reading your stories and sentiments, too! It's dishes like this that are my absolute favorites - the ones that trigger memories that make you smile. I loved reading about this one and all the memories with your family! I've actually never had congee before. It looks so warming and comforting. It is soooo cold here right now - I could definitely use a bowl to warm up with! Thanks so much, Ashley. These are such sweet comments from you all! If you ever go to a traditional Chinese restaurant that serves dim sum (usually on weekend mornings), they should have it. It's worth a try...kind of like a rice-like soup with savory fillings. It is very much something you want in the winter and we have record LOW temps here right now so this is the kind of thing I'm thinking about. Thanks again! I love foods that are attached to happy memories! What a fun story of you and your sister. :) Your congee looks like the perfect comfort food- so delicious! I cherish these food-related memories, Betty. Thank you so much! I think everyone has special memories with their grandma, mother and siblings and it's the food memories that always connect us to them. I have never had congee but I make a similar dish with rice and love a lot. Like you I prefer a thick flavorful porridge. Absolutely right! It does connect us all and it's something we can all relate to. And it's kind of like dumplings...we may come from different places but we all have these similar foods that connect us in a great way. You guys are being too nice about my ramblings! I was actually hesitant to even post this up since I'm not really an authority on it and my 'recipes' are so loose and informal when it comes to food like this. Thanks for reading, Consuelo! I also love learning about food from different cultures and seeing the difference and the oh, so many similarities! I love Indian food but there's so much I don't know. I'm glad to have sites like yours to learn from. Thanks, Ami! Monica, I've never had congee, but you've definitely peeked my interest! It looks good! Thanks - they serve small bowls of it during dim sum (weekend brunch) at Chinese restaurants and you can often order it as well at other times. Your congee looks fabulous. I'm also a fan of thick congee - I'll have none of the watery kinds. Might as well just drink water then, right? I love the "thousand year eggs" too - I actually have never tried it directly in my congee so I will have to buy some the next time I am at the Asian market! It is a meal in itself, true! Stay warm! I loved this post - food that has childhood memories attached to it is the best in my opinion! hehee...it is kind of comical looking back on it but that's totally what she would do. And I loved it! I'd watch TV and eat her food and snacks. It kept me occupied. I like congee, but have not made for years...as I always try to get when we go dim sum...thanks for the recipe Monica...congee brings memories of my childhood. Enjoy your week...Happy Chinese New Year! Happy Chinese New Year! I'm certainly glad for all the dim sum restaurants that make it easy for us to go and have traditional foods at our whim. Yes, it is our version of "chicken soup" for the sick. Very comforting and warming for sure. Hey, we have the same coloured Le Creuset pot! Hehehe. Mmmmm, I grew up eating congee for breakfast. Which reminds me, I should make some for my kids...YUM! Awesome! : ) And yes, make some for the kiddos. Rice dishes definitely have something about them that is totally comforting and satisfying. Especially the ones that have a fluid/soupy base. I am a big congee eater. We get it in Chinese restaurants big & small over here. I almost always order it for the boys( because it is filling and not spicy) and end up finishing it myself. My favourite is a seafood one. Now that I have the recipe, I am excited to make it at home. Loved reading about your food memories..so sweet! It's so true about rice dishes. Glad you and the boys like congee! Seafood ones are excellent - love it with peanuts on top and some slices of ginger. Yum!! One of my coworkers always brings in congee when she's sick, but other than that, I have no experience with it! Sounds like a fabulous comfort food! Yes, it is like chicken soup...the hot broth, porridge hits the spot when you are not feeling well and don't want anything too heavy. In that case, a thinner porridge probably makes sense. HAHA! I am not a very good Chinese home cook either! My mom never cooks very traditional Chinese food. She likes to cook modern and creative dishes. But she does make really good beef porridge. She makes that when we are sick. Anyway, yours look very comforting. I would love some and some century eggs.